the silent sales people. They do their job all day and night, never tiring, never complaining, always quiet and never call in sick. 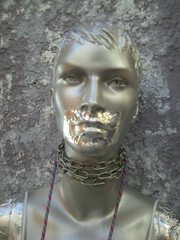 Even Dave Scarrott the traps, lures and scarers man had a mannequin on sale with his collection. 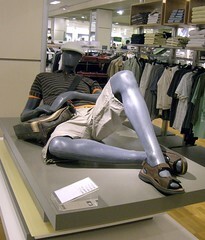 He was only offered 10 pounds for it and decided not to let it go for this paltry sum, mannequins are valuable. 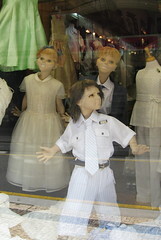 Sarah recently noticed that Portugal provides both attack and big-denture’d mannequins in the same window displays commenting that they are way more scarey than Jackson’s child mannequins. 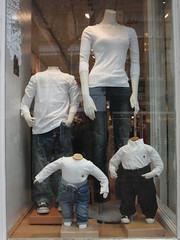 Dave, Sarah and Jacksons have tuned their psyche’s in to appreciate the value of a scary mannequin and sizable dentures. Excellent. In John Lewis’ this chap demonstrates a shoulder bag, hat and khaki cargo pants, he has almost all the necessaries to be a real dude. A friend cited a blog post on Jacksons that I hadn’t yet written. I suspect this is because my conversation and blog posts become indistinguishable over time as they ferment. 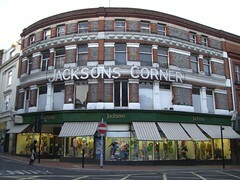 I’m fermenting a whole series of posts on the outstanding store that is Jacksons, that rightfully has a whole corner in Reading named after it. 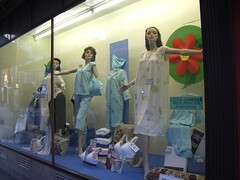 We’ll start outside with the outstanding window displays. These are reminiscent of the 1960’s. The paper backdrop of large flowers could have been made, lovingly, by my mother, or yours. 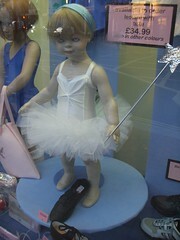 Thoughtful, personal, tailored rather than mass produced, I find the displays enticing. 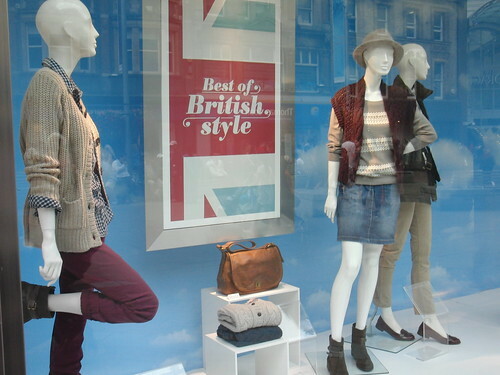 Even the Mannequin’s look like they’ve escaped from the 1960’s. With humour. The Ladies nightware is cleverly marketted as ‘Slenderella’ and ‘Damella. But the names don’t quite make up for non-topical goods. You have to prize non-topical good to buy this nightware. The store cares, next to the sign indicating that they have the ubiquitous CCTV is one pointing out that their floors MAY be slippery when wet. another sign lets you know that for our own safety we should not lean against their windows. Is there an ominous side to this? Are they teasing us? Which floors are wet and which are dry? What will happen if we lean against their windows? Other Mannequins display a slightly non-sober jaunty angle with their wigs and hats. Explore my flickr photographs of Jacksons for the full effect. Rarely can I resisit going into Jacksons. The inside of the store is another set of stories altogether. Worth waiting for.